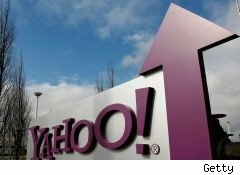 Yahoo's (YHOO) stock price jumped 13% Wednesday on news that AOL (AOL), a company one-tenth its size, is in talks with several private equity firms to purchase the purple-hued Internet pioneer. AOL, the parent company of DailyFinance, has been approached by several buyout firms about acquiring Yahoo, according to a report in The Wall Street Journal. The firms are reported to include Silver Lake Partners, which recently bought Skype from eBay (EBAY), and Blackstone, run by finance mogul Stephen A. Schwartzman. AOL's market capitalization stands at about $2.7 billion, roughly a tenth of Yahoo's $23 billion stock market valuation. The private equity firms are interested in either teaming with AOL or buying Yahoo outright to take it private, according to the paper. At least two or three other buyout firms might join the deal if talks progress. But, citing anonymous sources, The Journal cautioned, "the conversations may not even lead to an approach given the complexities inherent in structuring a proposal." For weeks, AOL, which is in the midst of a turnaround effort led by former Google (GOOG) advertising executive Tim Armstrong, has been the subject of rumors that it would buy -- or be bought by -- Yahoo, the ailing Internet behemoth. One possible scenario involves the sale of Yahoo's 40% stake in Chinese Web giant Alibaba -- a position worth an estimated $10 billion. The proceeds of that sale would then be used to help finance a reverse buyout of Yahoo, led by Blackstone and Silver Lake. Armstrong, who leads a cadre of technically-minded former Googlers steeped in Web-oriented algorithmic formulas, would then be named to lead the combined company, according to this scenario. Armstrong, who has vowed to make AOL the world's top Internet content company, would assume control of a combined entity -- including Skype, assuming Silver Lake participates -- worth about $15 billion, over five times what AOL is currently worth. Yahoo successfully fended off a $40 billion takeover attempt by Microsoft (MSFT) in 2008. That saga ultimately led to a search partnership between Microsoft and Yahoo, which seek to challenge Google's Web search dominance. AOL, for its part, just renewed its own search partnership with Google. It is not clear how a theoretical AOL buyout of Yahoo would affect these various search deals. All parties named in The Wall Street Journal report either declined to comment or did not respond to requests for comment. It's very likely that any of the scenarios under discussion would attract regulatory scrutiny. AOL, the 1990's-era dial-up Internet pioneer, spun off from media giant Time Warner in December 2009, a decade after the two merged in one of the most ill-fated pairings in corporate history.